A behind-the-scenes look at the life of the most extraordinary martial artist of all time-Bruce Lee. Bruce Lee: The Celebrated Life of the Golden Dragon is a photographic catalog of all facets of this fascinating man, from the start of his career to his untimely and tragic death in 1973. This book reveals a quiet family man behind the charismatic public persona. It shows the real Bruce Lee-the man who was so much more than an international film and martial arts celebrity. This brilliant photo essay-compiled and edited by Bruce Lee expert John Little with the assistance of Lee's widow, Linda Lee Cadwell-reveals never-before-published family photos, including rare photos of Bruce's childhood in Hong Kong. Tender moments with his children are caught on camera, and action shots from his martial arts films are shown. John Little is the world's preeminent authority on Bruce Lee and his work. He is the former associate publisher of Bruce Lee magazine, former managing editor of Knowing Is Not Enough the official newsletter of the Jun Fan Jeet Kune Do Nucleus, and former director of the Bruce Lee Educational Foundation. 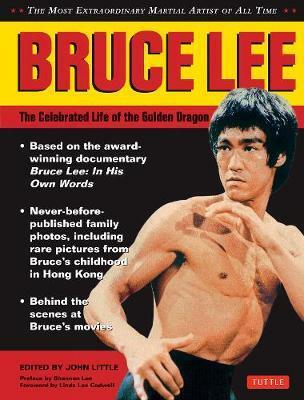 He's shared this information with Lee's fans in his other edited books published by Tuttle Publishing, including: The Art of Expressing the Human Body, Bruce Lee: Artist of Life, Jeet Kune Do: Bruce Lee's Commentaries on the Martial Way, Letters of the Dragon, The Tao of Gung Fu: A Study in the Way of Chinese Martial Art, and Striking Thoughts: Bruce Lee's Wisdom for Daily Living.